Remains anticoccidial immunity formation capacity. 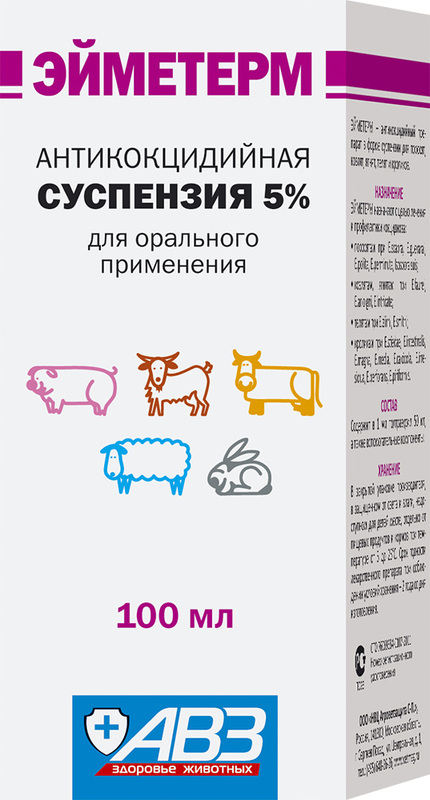 Promotes fast livestock recovery from coccidiosis. 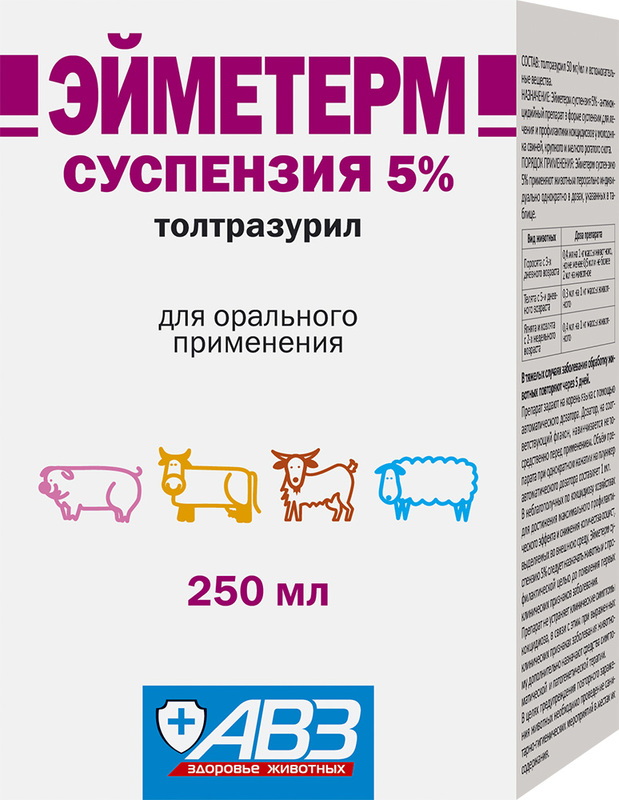 Eymetherm 5% suspension is a triazinetrione anticoccidial drug. 1 ml of suspension contains toltrazuril - 50 mg (as an active ingredient) and excipients. Toltrazuril blocks respiratory enzymes, provides damaging effect on coccidial mitochondria and nuclear fission violating macrogametocyte formation and causing death of parasites. Used to treat and prevent coccidiosis in piglets, calves, kids, lambs, baby rabbits and puppies. Increased individual sensitivity to the drug components. Due to the drug excretion in milk, do not use it in milking cows. Before use carefully shake a bottle with suspension to full residue distribution. Oral administration on the base of tongue with a syringe dispenser or automatic measurer which is screwed on the bottle of appropriate volume immediately before use. Volume of the drug obtained with a single click on automatic measurer plunger is 1 ml. In severe cases reprocessing must be performed in 5 days. In order to prevent animal reinfection, carry out hygienization at places of their keeping. 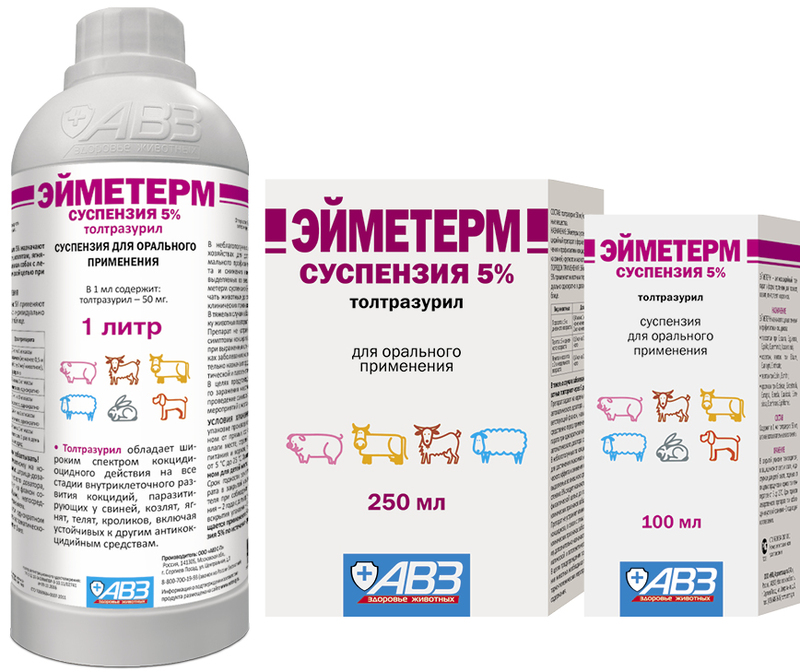 Coccidiosis troubled farm units: administer Eymetherm 5% suspension before the first clinical signs of disease to achieve peak preventive effect and decrease in oocystic quantity evolving in environment. The drug does not remove clinical symptoms of coccidiosis. Due to this fact, administer additional symptomatic and pathogenetic drugs in frank clinical signs of the disease. Piglets are allowed to be slaughtered for meat not earlier than 91 days after the last drug administration. This term is 70 days in calves, kids, lambs and rabbits. Meat of compulsorily slaughtered animals received before stated period termination can be used to feed fur animals. Adverse events are not observed in case of administration as per package insert. In case of increased individual sensitivity to the drug, allergic reactions may be observed. In this instance administer antihistaminic and symptomatic drugs. Store in original package at 5-25°С. Protect from light and moisture. 100 ml, 250 ml and 1 l bottles.